Having recently returned from the 3-day hen do of my soon-to-be sister-in-law the time seems right for a post on engagement rings. As luck would have it, the launch last week of Tiffany’s Engagement Ring Finder iPhone app (more below) makes the story newsworthy too. 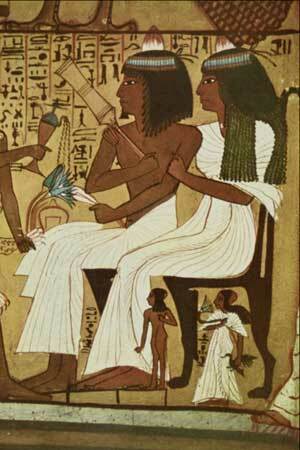 What follows is by no means a full chronology, but a few fun facts nevertheless. • The notion of a ring as a marital symbol can be traced back to North Africa of 5,000 years ago and rings made of reeds and grass rings are depicted in images of that time. The circular Egyptian hieroglyph stood for eternity whilst the hole in the middle represented a gateway through which the wearer entered into a new partnership. •In ancient Rome and Greece rings were placed on the fourth finger of the left hand because it contained the vena amoris, or vein of love, which reputedly led straight to the heart. •When Archduke Maximillian of Austria used a diamond ring to tie the knot with Mary of Burgundy in 1477 he sparked off a craze that lasts to this day. •During the 16th century the practise of engraving simple sentimental statements such as ‘I love you’ on rings became popular. These love tokens were known as poesy rings. This one dates back to the Renaissance. •At around the same time gimmel rings (made of 2 or 3 hoops or links that fit together to form one complete ring) were often used as betrothal rings in Europe. The engaged couple would wear one hoop each and rejoin them to use as a wedding ring. 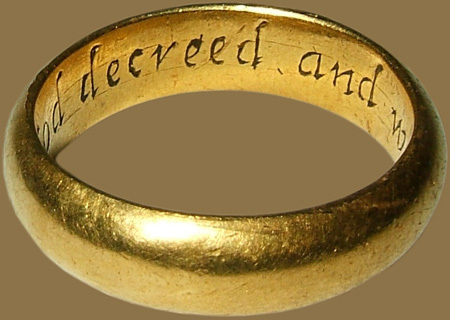 Martin Luther popped the question to Catherine Bora in 1525 with a gimmel ring that bore the legend: ‘Whom God has joined together, let no man put asunder’. •Prior to the end of the 19th century it wasn’t uncommon for the lucky bride-to-be to receive a sewing thimble. •De Beers have a lot to answer for. In a bid to boost sales they spread the rumour that a man should blow three months' wages on an engagement ring, and in 1947 they came up with the oft-quoted slogan 'A diamond is forever'. •In addition to being valuable, the diamond has been attributed with a host of desirable properties including the ability to ensure loyalty and fidelity. 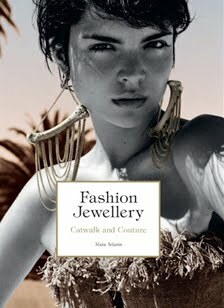 The name has its roots in the Greek word Adamas, meaning invincible – which puts a whole new spin on my surname! 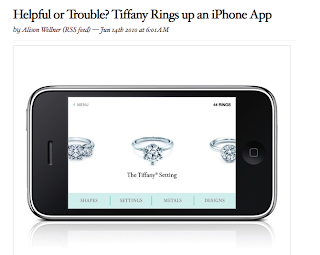 •Fast forward to 2010 and Tiffany & Co.’s Engagement Ring Finder is a first-of-its-kind iPhone app that includes a Ring Sizer facility, access to a team of expert consultants, and a range of styles that may be viewed with diamonds of six different carat sizes. 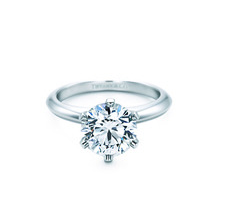 •The Tiffany setting – a claw that holds a gemstone to a plain band ring – is the most common setting for a diamond solitaire. Oh! I want a ring like that posey ring that dates back to the Renaissance. I wish I'd come across something like _this_ at a flea market or something.